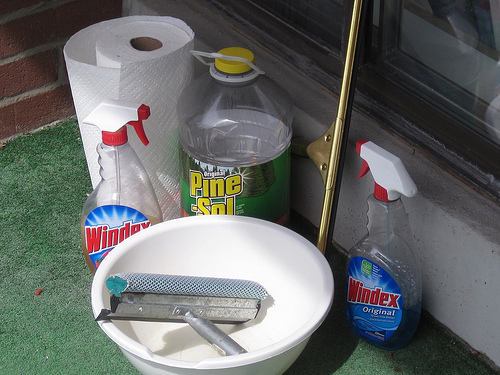 Photo of cleaning supplies by Pat00139/Flickr Creative Commons. In 2007 I became a homeowner. Great timing, right? But that’s not the point of this story. The point of this story is that I grew up in sunny bright southern California, and in college I fell in love with the progressive playground that is Portland, Oregon. So I moved there, right out of college, newly engaged, and bought a cheap home with my man. Flash forward 5 years, and 5 long cold wet dark depressing Portland winters, and we sun-spoiled Cali kids were over it. We high-tailed it back home to the land of unending warmth and unfortunate materialism (it’s a trade-off). And what of our little house? Well, like so many, it was worth less than we owed, and so we couldn’t sell it. We rent it out now, to a lovely couple who keeps it well-tended. For now. We are lucky, because some of the stories I have heard from other landlord friends . . . it scares the shoes off my feet. Tenants can be reckless and irresponsible and downright disgusting, if we’re being honest. And “tenant aftermath” is simply a reality of renting out a home. So what’s a landlord to do, if your tenant left the unit a mess? If the tenant has left personal items like clothing, furniture, etc, you are required by law to keep them in a safe place. Stash them in the garage, a shed or you might have to rent a storage unit (which would come out of the deposit). The length of time you are required to keep them is governed by state law, so check your local regulations. Any damage incurred to the property should be repaired using the security deposit. KEEP ALL THE RECEIPTS. Mail copies to the new address, or if there is no new address, the last known address, of the tenant (which may end up being the unit itself, but do it anyway for legal purposes). If there is any deposit remaining after everything has been fixed, include a check for the balance when you send the copies of receipts. What is considered “reasonable wear and tear” can be difficult to quantify, and it’s not always clear what constitutes normal deterioration (i.e., carpet wear) versus actual damage (i.e., cigarette burns). The length of the tenancy must be taken into consideration when assessing “reasonable wear and tear” as applied to paint, carpets/floors, cabinets, etc. State law also varies on this, so check your local regulations. Dirt is not considered “wear and tear”. A unit left excessively dirty or full of trash should be cleaned with the cost coming out of the security deposit. It’s a good idea to take photographs before doing anything. Use a professional cleaning service and keep the receipts of all the cleaning that you expect the tenant to pay for (using their security deposit). Know your rights and your tenants’ rights, and work within the law. Do not get angry or act rash. Keep it legal and by the books – this will protect you if anything goes to court. Understand tenant rights and responsibilities. HUD is a great place to start. You can also search for local Tenant Advocacy Groups, which will be able to provide more information. Your local Legal Aide Society may also be able offer free advice.